The hostel is located in an Historical house in the center of Shkodër. it has over 100 years old and was built by an Italian ancestor of the owners who moved to Albania who made it their family home. It has the form of the traditional home of the city: it has two floors, a large main entrance, many windows on the first floor, stone walls, a garden with fruit trees. We have used vintage furniture of the family and friends to furnish the house. We've dedicated the hostel especially to travelers that enjoy hiking, biking, and mountaineering, but it is open to all who simply love life, nature, human contact, bioeating, and special tours. Our place is absolutely the best to relax, recover, have fun, stay safe, and learn new things while in Shkodër. In winter our rooms have heating and AC in summer. We are located in the center of the city. Find Kinema Milenium, we are located on the other side of the street down a short alley. Look for the gate painted bright blue with the words "Mi Casa es Tu Casa"
Remember: You always should ask for 'Kinema Milenium' wherever you are in the city. We love animals , we have resecued 3 dogs from the street and also one cat. Wonderfully welcoming place in great location. Amazing value as well including delicious breakfast. Shkodra itself is a charming place and well worth a visit. This hostel truely was incredible! Has such a homely feeling as soon as you walk in! Located right in the town centre and close to all attractions! Staff were amazing and helpful with both suggestions on things too see and assisting with transport! And to top it off a absolutely amazing breakfast each morning!! Recommend it to anyone visiting Shkodër!! Loved my stay here! Great location, lovely staff, good facilities and also comfortable beds. Would definitely go back! This is one the best hostels I’ve ever stayed in. Alma and her daughter are wonderful hosts. So welcoming and willing to share their knowledge with the guests. Every morning they prepare a great breakfast with locally sourced ingredients. Definitely take all of their recommendations for restaurants and places to visit. Thanks so much! 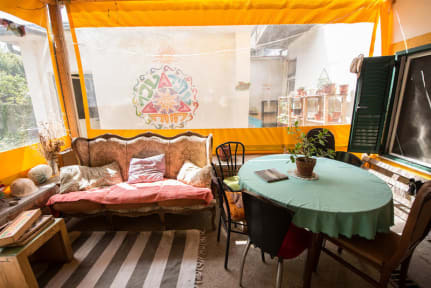 Simply wonderful hostel: exceptionally clean, beautiful and colourful, and friendliness and eco-friendliness abound. You feel at home as soon as you enter: the staff are charming; a fireplace is next to the reception; and you can buy handcrafted goods whose proceeds help the women of rural northern Albania who produce them. Breakfast uses only locally sourced produce, which is delicious! Overall, then, I cannot recommend this enriching, uplifting hostel enough! This is just a beautiful hostel! It’s a must place to stay if you are visiting Shkodër. The hospitality, advices, smiles, amazing people, tasty breakfast, beautiful furry friends and much more is what makes this places absolutely sensational. Also definitely take your time to talk to the owner and her daughter to listen to their story as it’s amazing. Would highly recommend this hostel to everyone who travels, it’s also 2 minute walk from the main bus stop, supermarket and cafes. Thank you! Very good hostel! Best breakfast ever! It's a place with really magical vibe. Run with a lot of care and warmth. Alternative spirit all around. And the breakfast is amazing. Both the food and atmosphere. Much much recommended!! :) Thank you again! The breakfast is amazing and the place is very well decorated. The location is nice and the staff is helpful. As soon as I opened the gate and was greeted by the dogs, I felt like I had arrived home! Such an incredibly welcoming place with Alma and her crew. Great recommendations, spacious areas to hang out and meet others and the breakfast is phenomenally good! One of the best hostels I’ve stayed at in the Balkans, definitely highly recommend if you’re planning on visiting Shkoder!